The 2541 Series kilns have the room and capacity for production work. Or really large pieces. 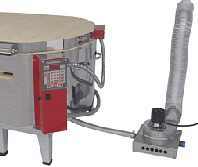 This is the favored kiln for glass painters as the precise design has made for truly even heating throughout the kiln. This is EvenHeat's best selling kiln (and our best seller for sizes over 14"). This is a tough kiln to out grow. Available in both 9" and 13" deep versions. Requires a 240 volt, 50 amp electrical circuit. The RampMaster 3 Controller with Express Mode gives you ultimate control. Express Mode is a three step program: Set the COE of the glass you are firing, your firing style (slumping, tack fuse, full fuse or casting) and the speed you wish to fire at. Use the Custom Mode to enter the ramp (rate of temperature change) set point (the target temperature) and any soak (time spent at target temperature). Up to 32 different segments (ramp, target temperature and soak = 1 segment) may be programmed in. And the unit will store 12 programs (sets of segments that make up your firing schedule) for quick and easy recall. While the kiln fires, the controller display shows the current kiln temperature and which segment is being processed. While your program is running, you have the flexibility to change settings on the fly. 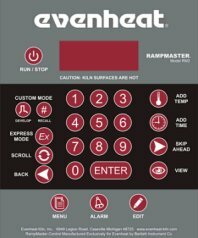 New Alarm Feature for 2010: RampMaster III controllers have an option to sound an alarm to tell you that your program is at the "process phase" where control or intervention on your part might be critical. You can then keep an eye on things as your glass begins to slump or when you reach full fuse. An alarm can also be set to let you know when your work is entering the annealing phase. In that way, you can check to be sure your piece has fused or slumped to your satisfaction. Comes with RampMaster III Controller as standard equipment. The Set Pro Controller is a snap use. You easily enter the ramp (rate of temperature change) set point (the target temperature) and any soak (time spent at target temperature). Up to eight different segments (ramp, target temperature and soak = 1 segment) may be programmed in. And the unit will store four programs (sets of segments that make up your firing schedule). Set up is quick and easy with digital read-out and three buttons for entering your firing schedule. While the kiln fires, the controller display shows the current kiln temperature and which segment is being processed. While your program is running, you have the flexibility to change settings on the fly. You can special order your kiln with a handy Viewing Window option. No more popping the lid to see how your firing is progressing. A viewing window is the most often requested option! The 2x4" window is a factory installed option. The Orton System gently ventilates your kiln when firing. Especially useful if firing paints and lusters or other volatile items. Also helps distribute heat inside the kiln. Can be factory installed or added as an option later. The vent draws air through 1/8" diameter hole, mixes the hot kiln air with your room air and exhausts it all through a metal vent tube to the outdoors. 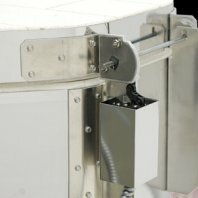 This Power Interrupt option automatically removes power from all heating elements as the lid is opened and reapplies power as the lid is closed. Those wishing to enter the kiln during firing should strongly consider requesting this option as an added measure of safety. Does not interfere with your kiln's digital programming. This is a factory installed option. The Dyna-Lift lid lifter takes the stress out of opening these large kilns. The lid on the 2541 kiln weighs 63 lbs. The counterbalancing Dyna Lift reduces the weight to just 8 lbs. It takes the stress off of you and off of the lid and transfers it to the kiln stand. Your lid will last so much longer with this option, and your back will thank you as well. Can be ordered as a factory installed option, or you can get one to fit your existing kiln. A six inch stand comes standard with the kiln. This option brings the kiln to a more convenient level. 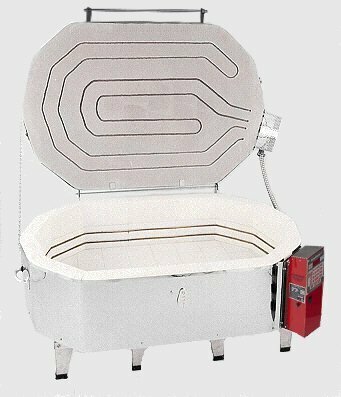 HOW TO ORDER: This kiln has several options for setup and we will special order your custom version from the factory just for you. This kiln must be shipped via Motor Freight. The shipping and handling charges that will added by our Secure Shopping Cart will be credited towards your Motor Freight Costs, however they will not cover the shipping cost total. Additional funds will be required and we will contact you with estimated shipping costs and payment methods. NEED HELP ORDERING YOUR KILN? The Sunshine Sales Staff will be happy to help you choose your kiln, suggest helpful options and arrange shipment of your kiln. We have been selling and using all styles of EvenHeat Kilns for nearly 20 years and will be happy to help you with your selection. Call us toll free at 1-800-828-7159 for assistance. Note: one rectangle shelf is required for the 2541-Series. A must when viewing materials in a hot kiln. Protects your eyes from harmful infra red radiation. Also has added benefit of making things easier to see in the kiln.